One of the most effective marketing strategies any business can implement is that of forming partnerships, most notably, joining efforts with nonprofit organizations in the community. There are a number of benefits to doing so. First, your company positions itself as a ‘good corporate citizen’, part of the community, caring and engaged. Not a bad image to have. You also earn the respect of the people of that organization: the administration and staff, clients and their families, and board members. This could amount to a significant number. Is there marketing value to your company? You bet. Here’s a good example. Keynote recently brought together four seemingly diverse entities – White House Fruit Farm, Second Harvest Food Bank, Alberini’s Restaurant and WFMJ TV – for an event as simple as an apple dessert recipe contest. White House will hold the contest and accept food donations the week of the event for Second Harvest; Second Harvest will supply the donation bins at White House; entry fees will be donated to Second Harvest; the director of the charity will be one of the contest judges; Alberini’s will donate gift certificates as prizes and Chookie Alberini will serve as a judge; commercials and promos will run on WFMJ TV and two of the station’s personalities, reporter Glenn Stevens and cooking segment host Regina Reynolds will help judge the recipes. The publicity for this event will be widespread and all four of the involved ‘partners’ will benefit. We anticipate significant participation by the public. A company’s relationship with a nonprofit can be a single-event as above, or ongoing. Encouraging your employees to get involved ‘hands on’ is effective as well. Every marketing plan we develop contains a public relations strategy based on this type of partnership. There is no downside. Remember, good marketing begins at home. Viral marketing. You’ve heard about it, but what is it? Simply stated, viral marketing or viral advertising is marketing strategies that use social networks to build brand awareness of a business or product. Uploading a promotional video to YouTube is a popular viral method. The whole idea is to get people to pass along the video to others, thus promoting your brand to a wider audience. And the best part is your only expense is in some minor production costs. What you do need to invest in, however, is the time to create a concept then find someone with a camera and some editing equipment. Does it work? It does if you do a lot of things right — right concept especially. The most effective videos are those that offer high entertainment value or deliver traditional messages in totally unique ways. Obviously you want the viewer to pass the video along to someone else, but you would also like that individual to remember your brand, and even look you up on the web for more information. That’s what Keynote is doing with our “Bob The Box” video. First we draw them in with cool, hip open and then offer some basic marketing tips. The ultimate goal is to use our ‘brand neutral’ BobTheBox.com website to drive them to one of our ‘brand’ sites: KeynoteMediaGroup.com or InsideTheBoxMarketing.com. I just returned from a five-day bicycle trip through western Virginia and northeastern Tennessee. 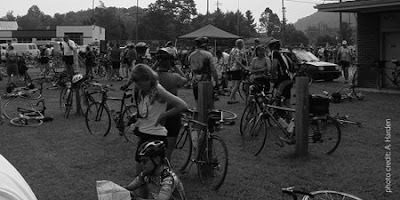 The event was hosted by Bike Virginia and attended by 1,800 avid cyclists from across the country. After a day of struggling up and coasting down some pretty substantial hills we camped on the grounds of local high schools in small to medium-sized towns along the route. Having done similar rides through Ohio, Oregon and New York over the last few years, these trips provide opportunities to experience breathtaking scenery, enjoy local culture, and meet some pretty interesting people from around the world. After a shower, the next thing on everyone’s mind after setting up camp is food. (Some days the tour covers as much as 100 miles, so calories are not an issue.) 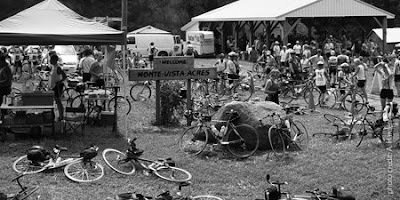 On every organized ride I’ve ever been on in the past, local restaurants made sure they had someone around the campgrounds passing out fliers with their menus and directions. The Virginia trip was different: no fliers, no directions. Riders were left to their own ingenuity or consulting with locals to find out the best places to eat. In addition to providing all the ride itineraries and amenities, it is usually up to the tour organizers to let the local businesses know that a couple of thousand ‘customers’ would be in town for a night or two. Either way, it was a missed opportunity. All it required was a business to invest in the most Either the locals on this trip never got the message or just didn’t care.basic of marketing strategies — a few printed fliers and a couple of high schoolers to pass them out at the campground. Cost? Probably less than $75. Three years ago a local public official in southern Ohio told me that when the Great Ohio Bicycle Adventure came into his town, cyclists and their families spent close to $100,000 in one day on everything from food to souvenirs. You certainly shouldn’t need a marketing consultant to give you this advice, but here it goes: Opportunities to brand yourself, sell more, or simply gain a little publicity avail themselves almost daily. Checking newspapers or websites can tell you a lot about what will be happening in your community, events of which you can take full advantage. This is basic “Inside The Box Marketing,” a marketing strategy you can implement all by yourself at very little cost. Remember, effective marketing begins at home. Here is a classic story I have probably told a hundred times. It’s a case of the quality of one’s advertising, whether radio, TV or print, speaking louder than the words or pictures contained therein. And not in a good way. This is what I call ‘Brand Busting,’ where brand perception and brand reality are diametrically opposed. The names, by the way, have been changed to protect the guilty. A number of years ago I was referred to a client by a local radio rep. This individual was a big advertiser on both radio and in print. He spent a boatload of money, however the quality of his advertising was extremely low end. Naturally, I assumed the merchandise he sold was of the same quality. Sartorial attributes: Leisure suit (lime green), white shoes, white belt, open-collared shirt — probably orange in color — revealing a gold chain or two, black transparent hosiery. Distinguishing characteristics: mole just above left eye; wears soda-bottle-thick glasses with black frames; cheeks sporting a perpetual red hue; sideburns to die for. Well, at least that’s what he sounded like on the radio. The station rep told me that this store’s problem wasn’t traffic — people were coming in the door. The problem was they just weren’t buying. Customers would walk in, look around, and then head to Valu-Mart. Sales were abysmal. The sense of panic amongst the staff, palpable. The radio rep pleaded, “Could you talk to him and see if there was anything you could do?” As much out of curiosity as for the quest for new business, I agreed to place the call. Five days later I walked in the store’s door, ready to finally meet the embodied Voice of Mahoning Valley Retail. After a few minutes of roaming through some pretty nice looking, definitely-not-cheap merchandise, the receptionist showed me into the legend’s office. He stood up from his beautiful mahogany desk. Gulp! Who the hell was this guy? In his early 50s, his salt-and-pepper hair was, well — perfect. And not only was he an obvious graduate of the George Hamilton School of Tanning, he sported the whitest teeth east of the Mississippi. His right hand extended, walking toward me was an obviously fit man sartorially resplendent in a navy blue blazer, light blue dress shirt, red and navy striped tie, khaki slacks, and burgundy penny loafers (beyond that, I was guessing boxers). “Hi. I’m Clyde Summerfield,” he beamed. I froze in my tracks. “Ahh, no your not,” I responded, my voice dripping with equal amounts of disappointment and shock. I felt myself sinking deeper and deeper into the office’s rich, shag carpeting. “Sorry, Clyde,” I apologized, “but that’s how you sound on the radio." Dazed, he shuffled back behind his desk. He gestured toward the wing back chair across from him. I settled in and the ensuing conversation took on a rather serious tone. Drop in next week for Part 2. Does Clyde see the light or is it business as usual?